I love sharing the products that are in my everyday makeup bag; the ones that I currently reach for. Some are staples and others are recently rediscovered items that are soon going to become staples in my routine. 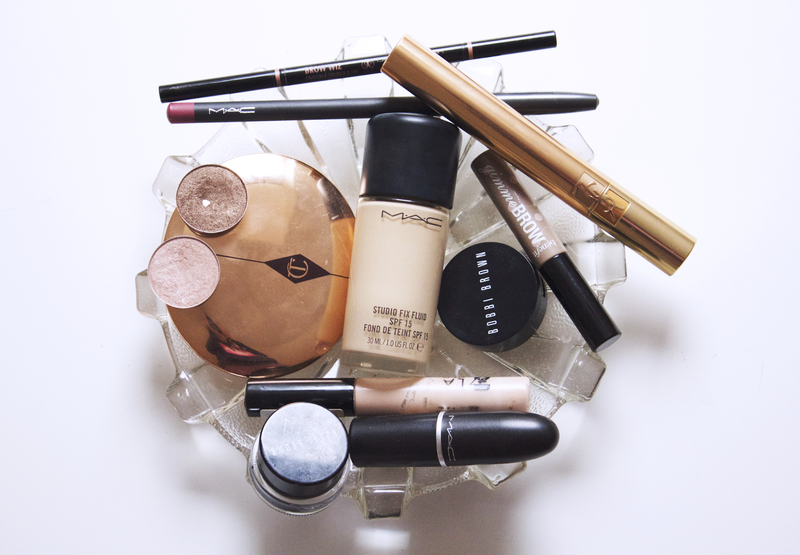 I feel like recently, all I have talked about is Mac Studio Fix Fluid foundation. I actually wasn't expecting to like this foundation as I had heard it breaks people out (it hasn't, yay!) and was for more oiler skin, but I completely fell in love with it and it is probably my favourite foundation ever..which is saying something as I have tried about 500 different foundations. For under my eyes, I use my trusty Bobbi Brown Creamy Concealer, the formula of this is lovely as I have such dry skin under my eyes and this is so creamy and doesn't dry it out at all. For blemishes I either use my Collection Lasting Perfection Concealer or the Nars Radiant Creamy concealer, I'm currently using the Collection one but I have a new Nars concealer ready to go, for when I finish this one. I then set my makeup with Charlotte Tilbury Airbrush Flawless Finish Powder to make sure my makeup stays in place throughout the day. For my brows, I am back to using Brow Wiz by Anastasia Beverly Hills. I absolutely love Anastasia's brow products, the shade range is good and you can easily change the shape of your brows, I then set my brows with the Benefit Gimme Brow to make sure my brows stay in place and I don't have any stray brow hairs. On my eyes, I've been using Mac Naked Lunch and Woodwinked, then adding a thin line of gel liner, I love the Bobbi Brown Gel Liner as it doesn't smudge and stays put all day. I then finish my eyes with this mascara from YSL which I am in love with, my mum even asked if I was wearing false lashes! Score! For christmas I received Soar lipliner and Faux lipstick by Mac, which I really love, I don't usually wear this shade of lipstick but I've been loving how they look!